A dramatically new concept in simple, inexpensive, and accessible fluorescence microscopy. The Etaluma LumaScope provides provides fluorescence and brightfield capability in a small, portable, and easy to use microscope. Small enough to fit into a cabinet or workstation, the Lumascope is available with select new and existing Baker and Baker Ruskinn equipment. The powerful, new Lumascope 720 (LS720) adds walk-away automation to the many features and high performance of the flagship 3-color LS620. Exquisite XY motion control, motorized focus that allows autofocus and z-stacks, and easy-to-configure software combine to facilitate your microscopy experiments and high content screens. Place the LS720 in your incubator and you have a live cell imaging system at a fraction of the cost of conventional HCS systems. Whether imaging multiple fields in your flasks or 1536 wells of cells with 3 fluorophores in a 48 hour time-lapse, the 720 offers a whole new world of automated microscopy! LumaScope provides the three most important accessibility traits: It is significantly less expensive than other scopes, it is much easier to use, and its size and portability make it available anytime, anywhere. All without sacrificing the image quality you demand. 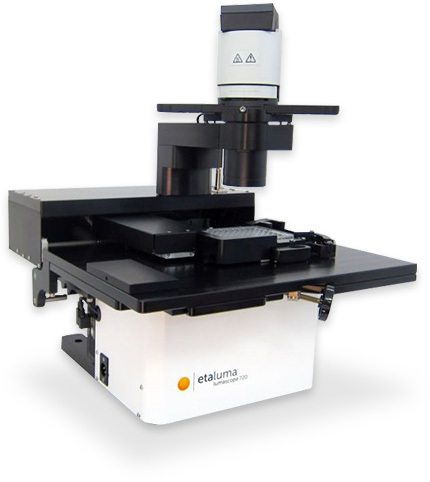 The Etaluma LumaScope is fluorescence and brightfield capable, providing high-quality images and fast frame-rates for easy routine inspection of cells in slides, plates, and flasks. The LumaScope is portable and fits into Baker cabinets and Baker Ruskinn hypoxia workstations with ease. Easy to set up and virtually no training required. To operate, plug the USB into any PC and start working - no AC power required. The LumaScope’s simple design dramatically reduces cost of ownership while maintaining publishing-quality images in brightfield, phase contrast, and multi-color fluorescence. More sophisticated uses are also easily achieved with the LumaScope: cell counting or hemocytometry and growth monitoring. Using the LumaScope, it is possible to monitor cells remotely through the web from within a tissue culture incubator, overnight, away from the lab.